A flagpole suspended off the ground by a series of lines, so that it appears to be floating, can be a really neat project. The structural principle has been referred to as tensegrity, and is based on using one half the lines to lift the pole off the ground, and the other half to give it stability, supporting it in a vertical position. 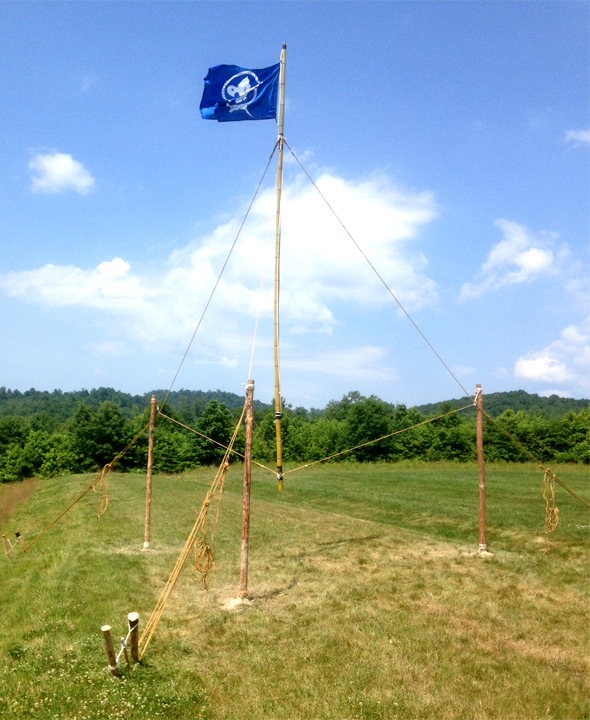 On occasion, Scouts choose to use more than three upright support poles, but just like with a simple flagpole employing three supporting guylines, three upright poles provide the required balance needed to hold the pole up straight. The longer the support poles, the higher off the ground the flagpole can go. Where the flagpole will be placed, 9 feet from the center of an equilateral triangle, three holes are made, 4 inches in diameter and 2 feet deep. A double pulley is securely tied to the top of each 10-foot support pole and a 50-foot guyline is reeved through each sheave. A 10-foot upright support pole is planted in each hole which is packed with excavated material. Three lengths of rebar are pounded in around each spar. 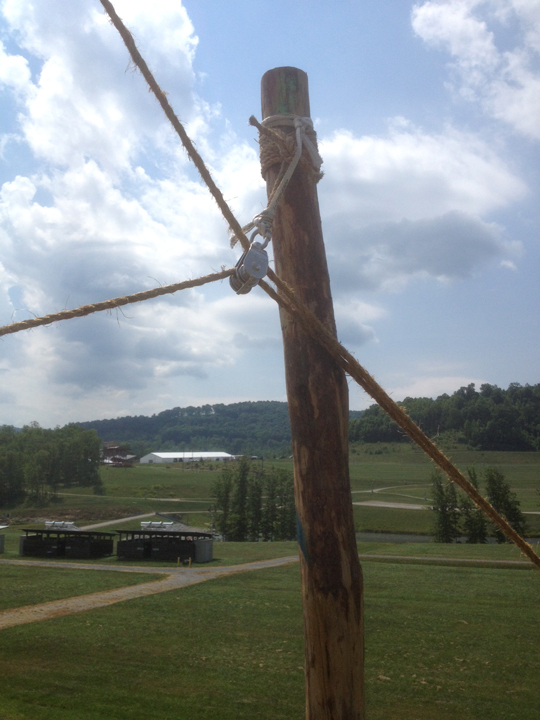 The metal ring is tied to the tip of the 20-foot pole and the halyard is threaded through. 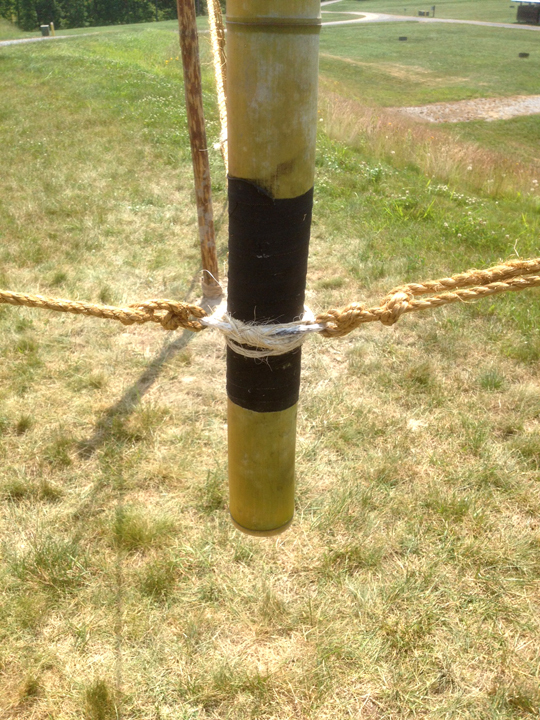 A tight jury mast knot (#1168 in The Ashley Book of Knots) is applied over the friction tape at the bottom and 4 feet from the top of the flagpole. The guylines from each upright support pole are tied to corresponding loops in the jury mast knots at the top and bottom of the flagpole with two half hitches, the tail of which is tightly seized to the standing part using binder twine with a West Country Round Lashing. 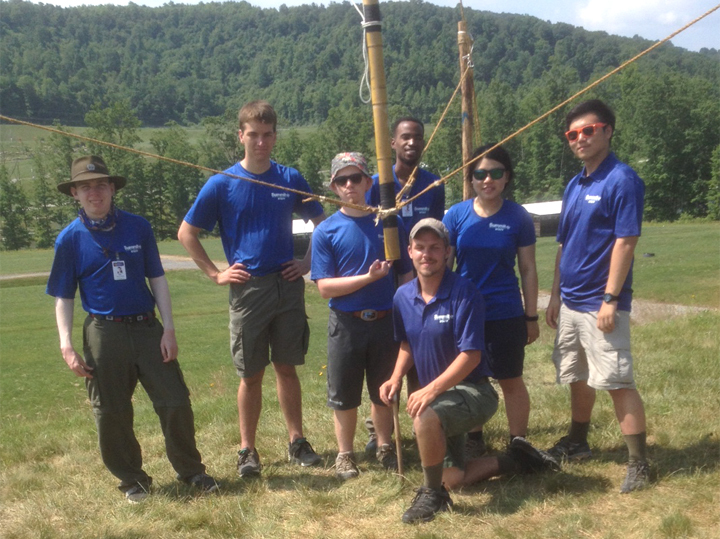 When the flagpole is rigged and everything is in place, two or more Scouts lift up the pole in the center of the triangle, and hold it erect. 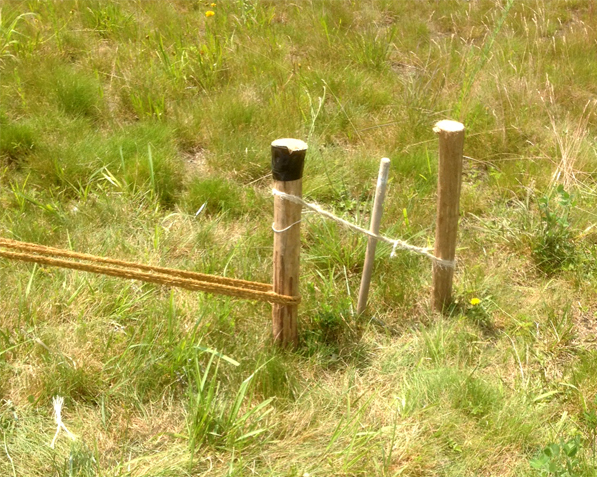 When the lifting guylines have taken up the strain to hold the flagpole at the desired height (about half the length of the upright support poles protruding from their holes), a butterfly knot is applied at the appropriate place and they are secured to the 1-1 anchor with a rope tackle. When the lower guylines are well secured, the upper, stabilizing guylines can be adjusted so that the flagpole is held up in a straight position. When the flagpole is even, the upper lines in turn are secured to their respective anchors with a rope tackle. —> An alternate approach can be taken in which the flagpole is first stabilized in an upright position by the three upper guylines. These can then be temporarily secured, readying the flagpole to be raised off the ground. 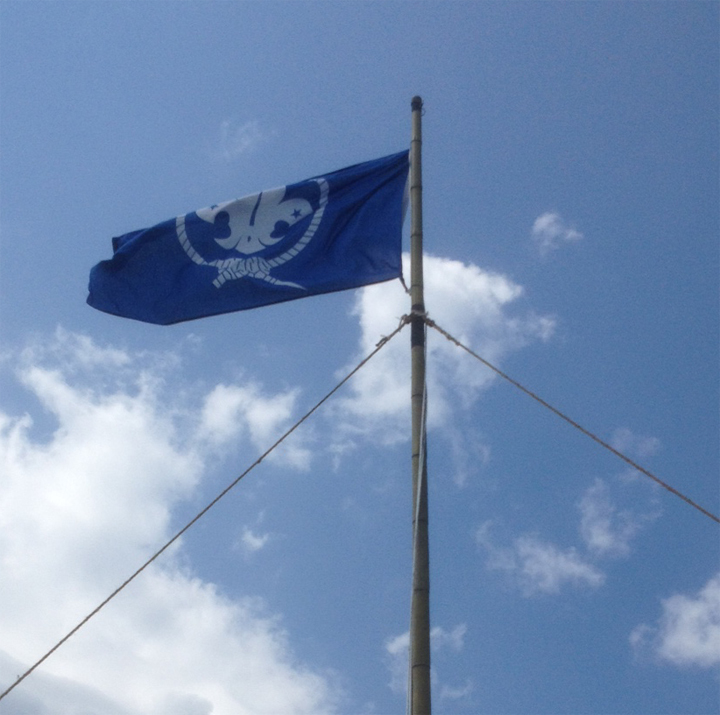 Once standing in a vertical position, upward force is applied to the flagpole by a Scout or Scouts holding on to the bottom and lifting, in conjunction with a simultaneous pulling on the bottom lines and a simultaneous easing off on the top lines. This lifting process is illustrated HERE.